What, I wonder, constitutes a Chinese, or for that matter an English, French, Italian, Spanish, Swiss, German, or American luxury brand? Does the brand have to be designed as well as hand-crafted locally? If so, is it a prerequisite that the brand’s designers and artisans are themselves local? Must it bear a name that sounds as if it is from the heartland of the home country? And what about a couple of hundred years of local history being a must, as well as the treasure trove of wonderful stories that tend to come with that? And surely it must tap in to the brand identity of the country of provenance – and be synonymous with one or more of the qualities that are spontaneously associated with the name of its home country? What about the requirement that its head office is based there and, also, that it is listed on the local stock exchange? Or, more reasonably, is “national association” achieved when a large proportion of the advocates of the brand would spontaneously describe it as a “[insert country here] luxury brand”; and then go on to talk about the country association being an important part of the allure of the brand. Using this test, Shang Xia would, I reckon, be one of the few brands to qualify as a Chinese luxury brand. 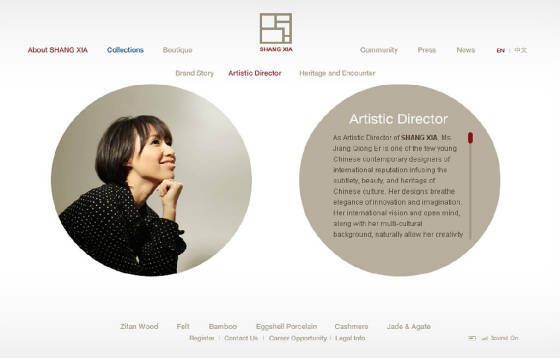 The collaboration between the Hermes Group and Ms Jiang Qiong’er (artistic director and CEO) opened its doors in Hong Kong Plaza on Shanghai’s Huaihai Road in September 2010. The shop showcases a treasure trove of hand-crafted jewellery, furniture, apparel, porcelain and home decorations. “Shang Xia has the ambition to preserve the beauty and techniques of traditional craftsmanship and embrace the elegance and simplicity of a new 21st century aesthetic”. This “fusion” of old and contemporary, traditional and innovative – all fashioned with great craftsmanship using quality materials – has certainly caught the attention of a certain kind of luxury-brand shopper in China. It is important to note that when Ms Ying talks about the “best of both worlds”, she is not referring to any notion of “east meet west” or a happy marriage of Chinese and international design. The two worlds she is referencing are both Chinese worlds. The first “world” spans five thousand years or so – from the Neolithic epoch up to the end of the Imperial age (funnily enough, the revolution that toppled dynastic rule began 100 years ago today and was the inspiration for this article). The finest of seventeenth, eighteenth and nineteenth century Qing dynasty porcelain is but a short walk away from exquisite jade carvings that were created during Neolithic times; which in turn abut a cornucopia of Song dynasty (960–1279) furniture, Yuan dynasty (1271–1368) calligraphy, and Ming dynasty (1368–1644) silks and costumes. Talking of Shang Xia (albeit using different Chinese characters), the Palace Museum also houses fabulous gold jewellery from the Shang dynasty (1600–1046 BC) and Xia dynasty (2100–1600 BC) inscribed drinking-vessels made of bronze. The second world that Ms Ying refers to is also very much culturally Chinese. This is a world full of drive, energy, and creativity that is characterised by continuous progression. Shang Xia captures the essence of this progression beautifully, according to Ms Ying: “It makes me feel so good to look at the pieces I’ve bought; they really remind me how far China has come,” she says. “I think more people in China realize the importance of looking back to our cultural roots, going back and trying to re-evaluate the value of Chinese culture. I’d say it’s still relatively few, but more are looking at the craftsmanship side of things – that’s the angle we start from,” says Ms Jiang (during a recent interview with Jing Daily). As more and more brands begin to unlock the great Chinese stories of artistry and design than span the ages, and start to render them in a relevant and contemporary way – employing the finest craftsmen to do so of course – then the nature of the luxury market in China will begin to change. The tipping point of this “Chinese luxury brand” movement is still a long way off, but there are sure signs that – among some key influencers at least – the revolution has at long last begun. This article was written in October 2011 when the author was chairman of Oracle Added Value (now part of Kantar Consulting), and published on Kantar's website as 'Best of both worlds'.